Check out mind-blowing, winter inspired nail art designs and ideas which are sure to get you all the attention at Christmas parties and New Year bash! Winter season is here! Even though the coldest months are yet to come, however, we are all geared up to welcome the cold weather with our layers of fashionable and stylish outfit ideas. We have successfully winter-proofed our makeup. The trendy blush and lipstick colors have been purchased. And, to celebrate the frosty season, we are also ready with winter-inspired nail art ideas. Since winter is one of the most important seasons in India, therefore our fingernails should also be all prepped up in style to welcome the coldest phase of the year. Zuri brings to you 20 sizzling hot nail art ideas for long, short, and medium-length nails which draw inspiration from motifs that represent winter in its full glory. 1. Embellished Frosty Nails: This one is a really stylish and easy-to-do nail art idea where you get to jazz up the otherwise dull winter nails with some bright, sparkly and quirky embellishments. Go for a classic silver and black combination and create a shiny snowflake impression with crystals or go for gold and purple color combo with studs of the color from the same shade card. 2. Geometrical Glittery Nails: One of the easiest nail art designs to try out this winter, geometrical nail art infused with a bit of golden or silver dust, sparkly top coat or shimmer can only get you all the attention at a social gathering. The idea is to make use of a scotch tape strips, carefully select the nail polish combinations and there you go! The first few times of trying out all by yourself will not help you achieve the perfectly geometric nail art design. With time you will become a pro at it. So, Zuri suggests trying out a simple pattern when starting afresh. Zigzags, sunbursts, and plaids can be done to perfection once you have perfected the art of applying scotch tape on your fingernails. 3. 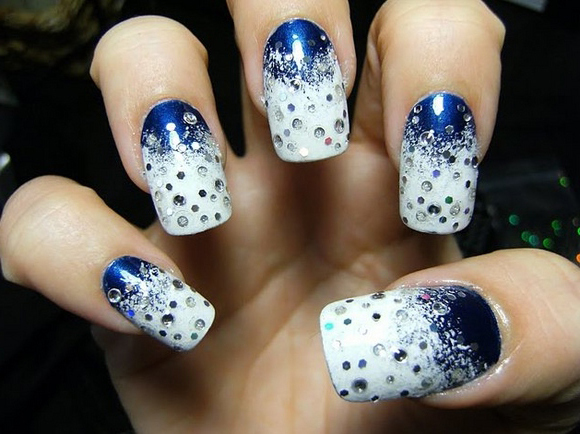 Winter Motifs on Nails: Winter is all about snow, fog, woolen layers, Christmas decorations and snowflakes! So, why not get inspired by the colors and motifs that speak winter out loud. Paint your nails with your favorite sweater design or amp up the style quotient with the bright party colors. Use glitter polish to make your fingernails stand out or choose from the shades of blue, gray, black and white. This also happens to be the time of the year when you can get your nails to act sober with white winter nail art ideas that everyone loves. You can also amp up white polish with a bit of creativity. Isn’t it elegant? 4. 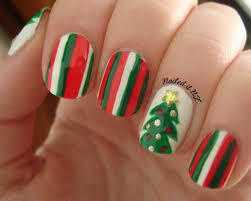 Merry Christmas Nails: Winter season is also about celebrating Christmas and partying away on New Year’s eve. To make it more of a Christmas color scheme- select from the shades of gray, baby blue, midnight blue, purple and chrome. These colors are the true depiction of cold winter nights. You can also choose to wear X’mas tree in green, decked up with tree ornaments (candy cane, lights, etc.) or recreate the snowman. Fill your nails with beautiful snowflakes with the gradient blue and silver metallic polish designs. Opt for a combination of nail polishes and glitter polishes for the sparkling effect. 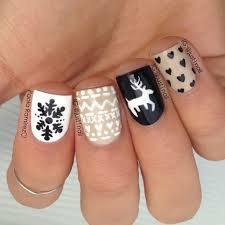 If you are looking to wear a cute Christmas motif on your nails, try out the adorable reindeer and throw in a few more abstract Christmas inspired designs, such as a red nose for Rudolph! Take a look at some of the best season inspired designs! Tell us which one is your favorite..